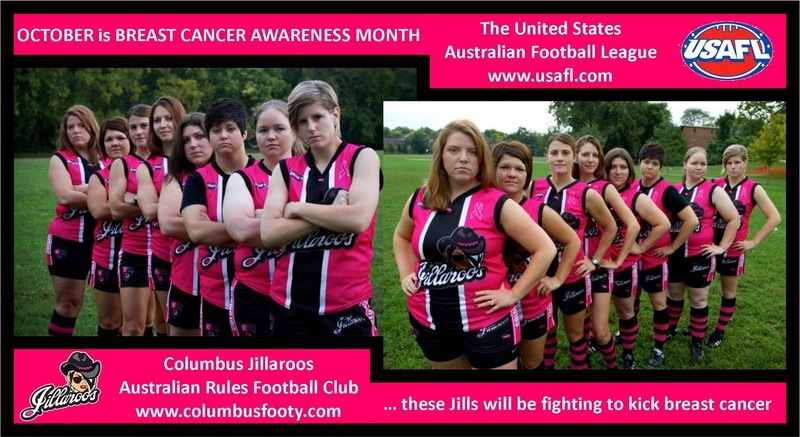 With Nationals now less than a week away, I wrote this article in tribute to the United States Australian Football League's efforts (specifically, the efforts of women's footy secretary, Andrea Casillas) to support women's health and female footy players, and to any family and friends affected by breast cancer. Australian Rules Football brings us together: eight women ranging in age from early twenties to mid thirties, from part time student to full time professional, from the novice footballer to the experienced athlete. Despite our differences, if you saw us on the pitch, you’d think we were all about the same type of healthy, “normal” young woman. Our footy skills would leave no room for wonder about whether or not something was wrong with us. Now look at the picture and try to figure out which one of us has dealt with breast cancer or breast disease. It's hard to tell just by looking, isn't it? Well, there isn’t one of us that's been affected; it’s half of us. Clichés are clichés because they are so true. Here’s one for you: you never know who’s dealt with this disease or not. My teammats are young, yet many of them have already been affected directly and indirectly by breast cancer; my life, too, has been "indirectly" affected. One of my best friends lost her mother to breast cancer when she was nine, subsequently growing up in a household of men since she only had brothers. A childhood friend of mine’s mother has had a decade-long ongoing battle with breast cancer that causes stress for the whole family; they never know when it, cancer, might rear its head again to deal its final blow. In high school, I ran track with a super star athlete who had full blown breast cancer in her teens. Another one of my friend’s mother died while we were in our early twenties. As for me, well, I had a tumor removed two and a half years ago, as a fair-the-well sendoff from the Marine Corps, one last free surgery before I was out the door and on my way around the world on my own terms. Even though backpacking through Europe with stitches in your breast isn’t exactly conducive to comfortable travel, I left one week after my surgery anyway. But ...I was embarrassed when I flinched while raising my arms to put on my pack. I was embarrassed that I couldn’t go for a jog for months. Moreover, I didn’t feel like myself; I was an athlete and needed to run and jump to feel alive. I was embarrassed when the stitches got infected, but couldn’t do anything about it, so I just went on with my plans. If I did mention it, people would often correct me, “You mean you had a cyst?” No, a tumor (of which I’ll likely get more, which could be cancerous, the doctors informed me post-surgery.) Yes, women our age, and younger, get breast tumors, breast cancer, breast disease. I was one week away from my 28th birthday when I had the surgery. Breast cancer isn’t about pink t-shirts, rosy cupcakes, and 20 mile power walk parties – it’s about your mom, your sister, your girlfriend, your friend. Though it affects everyone differently, the ripples it causes are much further reaching than its immediate victim. Please take a little time this month to think of, volunteer for, or donate to a breast cancer charity of your choice. Thank you.